The growing youth movement against Prime Minister Shinzō Abe is disrupting Japan's conservative status quo. Since the earthquakes and a nuclear meltdown in Fukushima hit eastern Japan in March 2011, fissures have opened up across the surface of the Japanese archipelago — and across the surface of Japanese society. Contemporary Japan is freighted with the triple weight of historical memory, natural disaster, and austerity — a situation sustained and compounded by the regime of Shinzō Abe, the most conservative prime minister the country has seen since World War II. But there are signs that this unstable status quo is producing its own revolts and generating its own forces of resistance at the core of Japanese society. In August and September alone, hundreds of thousands of youth, activists from across the social and political landscape, leaders of opposition parties, trade unionists, workers, and others held intense, nightly demonstrations against the Abe administration outside the National Diet, a force of direct political action unseen in Japan for many years. What explains this seemingly sudden explosion? The contemporary geopolitical landscape in East Asia is dramatically different from any the region has seen in the last century. In terms of economic power, Japan hasn’t stood alone as the region’s great capitalist power since the 1980s. It is increasingly challenged by a strong South Korea and an indisputably dominant China (to say nothing of the broader dynamics across Asia, the rise of India, and the continuing rise of the nations of Southeast Asia). The region is also experiencing significant political turmoil, with all three of the major East Asian states overburdened by the demands of historical memory. Under Xi Jinping, the Chinese Communist Party has become increasingly conservative, doubling down on party-state-driven nationalism and crony-capitalist bureaucratic tightening (with the occasional anti-corruption drive serving as a release valve). With Park Geun-hye at the helm — the daughter of Park Chung-hee, the country’s authoritarian, anticommunist, state-developmentalist leader from 1961–1979 — South Korea is in a position reminiscent of 1980s–90s Japan. A burgeoning media industry — the darling of inter-Asia pop culture — exists alongside a robust, state-led, conservative nationalism and an all-out war on the country’s trade union and workers movements. All three nation-states are squeezed into a narrow social basis of policy, in which legitimacy hinges on the awkward combination of affective appeals to national historical memory (for Japan, the fantasy of a “just war,” the “threat of China,” the peculiar admixture of self-images of power and victimhood; for South Korea and China, a hysterically anti-Japanese nationalism) and neoliberal capitalist pragmatics. Complicating matters is the deep integration of these three states — they are effectively each other’s largest trading partners. With the rise of formal negotiations between the ASEAN Plus Three (the ten Southeast Asian member states plus China, Japan, and Korea), regional economic integration will only deepen in the coming years. The contradictions of this situation, in which antagonistic national powers must violently oppose each other at the level of political rhetoric — making narrow, self-contained appeals to the nation — while simultaneously serving as each other’s key pillar of support at the level of the regional economy, should not be underestimated. Indeed, the perpetuation of this politico-economic arrangement underscores the peculiar functioning of the nation within capitalist development — but also the need for a mass politics to build itself at a distance from the state, in Alain Badiou’s terms. Against this regional background and under the administration of Prime Minister Abe, austerity policy has seen a remarkable transfer of wealth from the Japanese social services, new rounds of privatization, and corporate kickbacks at the expense of the working poor, youth, migrants, and precarious workers. No longer able to ensure the old modality of worker cooperation that existed in the postwar boom — led by a striking convergence between family, labor, and the firm — Abe’s regime has attempted to restart the model of “Japan, Inc.” But this time without the sense of social mobility that characterized the earlier “historic compromise” with the Japanese working class. In the 1970s, there was a sense among many Japanese people that they were living in a country of “a hundred million people, all middle class.” That perception vanished in the 1990s when the country’s economic bubble burst, and Japan continues to face a slow process of stagnation and emptying-out of robust postwar state institutions. By the mid-1990s economic divides had opened up more starkly. Declining profitability prompted companies to cut costs by increasing the number of employees without seishain (regular employee) status, and the language of kachigumi (winners) and makegumi (losers) started to pepper popular discourse. The Abe administration has exacerbated these trends, dealing the coup de grace to the last vestiges of the postwar corporatist model characterized by a relatively egalitarian distribution of wealth. Alongside a declining labor movement, and a retreating welfare state, the postwar consensus has crumbled and its core class conflict has sharpened. Abe is fired by a desire to restore the “glory years” of Japanese capitalism, make Japan competitive again, boost investment and financing, and create new, high-salary positions at the lower and middle levels of the workforce. But his economic policies have instead facilitated an enormous transfer of wealth to the Japanese elite. Real wages have declined by roughly 3 percent annually over the past two years, while a key platform of Abe’s, an increase of the sales tax from 5 percent to 8 percent, represents a direct political reduction of working-class households’ ability to purchase means of subsistence. Poverty has also steadily risen — at 16 percent, Japan’s poverty rate is now the fourth highest in the OECD. Meanwhile, corporate interests are doing comparatively well. The main effect of Abe’s quantitative easing programs, for instance, has been to bolster the stores of uninvested capital held by Japanese corporations, which currently stands at 2.62 trillion yen or nearly 60 percent of GDP. This is a staggering figure at a time when the average worker’s wage is being reduced both at the level of the firm and at the level of consumption through diminished purchasing power. Another damning juxtaposition: the percentage of precarious workers and the working poor is as large as it has ever been in the modern Japanese state — at the same time Toyota is posting record corporate profits of $18 billion on the back of Abe’s corporate tax cuts and a weakened yen. And unlike its past growth strategies, Toyota now prefers to hoard its profits rather than reinvest it in production. If it can’t raise consumer spending — which seems unimaginable at the moment — Abenomics will keep funneling wealth to the highest echelons of big capital, ensuring a grinding, vicious impoverishment of the Japanese working and popular classes. Not content with pushing trickle-down economics, Abe accompanies this with an openly fascist cultural policy, devoted to destroying the social basis of knowledge by persecuting even mildly critical journalism, whitewashing the history of Japanese imperialism and colonialism, and carrying through a series of reforms to higher education and to educational funding bodies that has the potential to permanently cripple the already-beleaguered Japanese public university system. In response to the Abe doctrine and the status quo more broadly, a movement — or at least an overall trend — of resistance has crystallized. This movement has taken shape loosely under the leadership of the organization SEALDs, or Students’ Emergency Action for Liberal Democracy. The name is no accident: SEALDs is by no means an organization of the Left as such, and has found itself in a more or less conflictual relationship with the more traditional Marxists of the Zengakuren, or All-Japan Students’ Coordinating Committee, the umbrella organization that has brought together student radicals in demonstrations and occupations since the 1960s. Launched in early May 2015, approximately two weeks before Toyota posted its record-breaking annual profit, SEALDs has been widely covered by a media that finds its slick presentation — placards, slogans, aesthetics — and its remarkable mobilizations compelling. The immediate catalyst for the SEALDs movement was the Abe administration’s controversial “reinterpretation” of the famed Article 9 of Japan’s constitution — which prevents the country from having a standing army and prohibits non-defensive military action of any kind — and new security-related legislation. The latter enables the Japanese state to provide “logistical support” and use full military means when pursuing “asset protection” of its allies, notably the United States. This legislation, both because of its relatively secretive nature and forced passing through the Diet, as well as its overtones of Japanese militarism, recalling the imperialist past and historical memory of the colonial system, proved highly unpopular — though it was welcomed among the country’s growing ranks of online youth fascists, the so-called netto uyo, or “internet right,” who are also guilty of spurring on the increasing levels of anti-Korean, anti-minority, and anti-migrant racism. SEALDs capitalized on this widespread opposition and built a mass movement, holding enormous, weekly demonstrations this summer in front of the Diet. These demonstrations didn’t prevent the security legislation from being approved. But they constituted an important sort of “propaganda of the deed” in showing not only to the world, but to Japanese society itself, that dissent from the status quo was possible, widespread, and shared by every social fraction imaginable. The success of SEALDs in emerging out of the youth movements, but with enough mass appeal to draw in a broad front of protest, cannot be overstated. In a sense, the critiques of SEALDs from the Left are entirely accurate: they do not possess a political platform that could truly present something outside the parliamentary consensus, and their critique is not subtended by a deep and radical analysis of the social foundations on which the Abe regime rests. This is true. At the same time, it is precisely SEALDs’ discursive and aesthetic flexibility that has allowed the movement to become the loose core of a quite diverse mass movement, in contrast to the existing institutions of the Left. The most important of those institutions is the Japanese Communist Party (JCP). One of the largest Communist parties in the world, the JCP boasts a membership of more than three hundred thousand and an influence that would be the envy of any left organization. Yet despite its size and reach, the party itself remains remarkably ineffectual. Since the 1950s, the JCP has been one of the chief practitioners of the “historic compromise” — a strategy of demonstrating one’s capacity to govern by adopting a reformism so intense as to wipe out nearly any trace of socialism. Without question, there remain major pockets of the Left in the JCP, but the party’s reaction to the youth mobilization of the summer and autumn exemplifies its cautious approach. At the same time that it warns of the dangers of “ultra-left adventurists” pushing a more militant line in the mass movement, the party’s chairman Shii Kazuo has overseen an attempt to forge a coalition government of all opposition parties to stop Abe. On the one hand, this effort risks erasing the opposition’s very real political differences and as a gesture, centralizes too many problems solely in the figure of Abe, who is, after all, merely a symptom of a broader political and social crisis of Japanese society. On the other, because the questions of historical revisionism, of constitutionalism, and so forth are so bound up with the particular expression of Japanese capitalism and political control at this global moment, one could also plausibly argue that Abe perfectly crystallizes the post-bubble Japanese situation, and that defeating his government is a crucial prerequisite for advancing any progressive politics. The SEALDs movement has gone about things differently, even if their goal has also been to bring down Abe. They call for a “new political culture” against the creeping fascism of the Abe regime. And though they lack a comprehensive political orientation that could transform their sectorial critique into systemic struggle, the movement has politicized a critical stratum of the population. Considering the radical depoliticization of high school and university students in contemporary Japan, the success of SEALDs in mobilizing young people for an explicitly political struggle — with demands that are radical at least at a symbolic level — is unprecedented. Whether SEALDs comes to constitute a true political alternative, they have already succeeded in bringing a depoliticized generation into its own through the transformative power of mass critique. For Japan, the experience of this past summer will produce new levels of political consciousness, and new fractions of society into which this politicization can spread. Unlike Greece or South Africa or many other places, the Japanese masses exist today at a vast remove from the Japanese left. Any popular action capable of bridging this gap therefore must be welcomed. If anything, it is now up to the Japanese left to capitalize on the growing politicization of youth to push SEALDs and other such organizations toward greater and more comprehensive demands on power, to make not only legal challenges to Abe, but also move toward being a social movement for economic and political justice at the level of the street. One of the enduring questions of our moment is why some of the strongest movements, and their accompanying forms of political consciousness, have come from outside the traditional left and its deep history of revolutionary politics — often from heterogeneous genealogies, unexpected popular arrangements, and previously unlikely social fractions. In a certain sense, this arrangement is one in which the previous alliances, linked above all to the existence of the Soviet Union, have fallen away or been discredited, and it is this new, untethered existence which both provides for all the limitations — acutely on display in the case of the SEALDs — but also the possibilities, of a new communism without guarantees. Perhaps we are beginning to see, on a world scale, a new dialectic of struggle: what were once reformist demands, linked to the simple change of institutional practices, today assume a peculiarly radical character in the context of contemporary capitalism and its political forms. This is not to suggest that such reformist politics will inherently win the larger demands that we hope for them, but is rather to suggest that the contemporary moment is characterized by a different cycle of struggles than we have been accustomed to on a global scale: an upsurge in political consciousness is emerging not out of the aftermath of intense class struggles at the point of production, but at an earlier moment in the social cycle. Stathis Kouvelakis, in a recent discussion with Alain Badiou, rightly points out that “in the current conjuncture, even very modest or moderate demands take on what I would even call revolutionary dimensions.” In Japan, the neoliberal consensus at the economic level, and its uncomfortable alliance with a muscular historical nationalism at the political level, constitutes an awkward but vicious impasse, one in which it becomes all the more crucial to inflict even small defeats on this structure. Simple opposition to this structure, mere suggestions that an alternative is possible — these take on a radical cast today. To animate the deeply depoliticized — whose passivity has been purchased by decades of compromise with the state-firm-family system of postwar Japan — is a radical act today. It is a radical act because it is also an acknowledgement that the social peace of yesterday can no longer hold. Perhaps even more worthy of comment is the relative absence of the institutional left. One can certainly point to this phenomenon as a marker of the weakness of the relatively modest demands and institutional hopes of such movements (as if the sole problem faced by the Japanese social formation were simply the removal of the Abe regime and not a particular mode of the development of capitalism and its political expressions). But one should also note the sense that the energy of youth, students, young precarious workers, migrants, and more is no longer necessarily mediated by the major institutions of the Left, but now makes direct demands on power without narrative guarantees. It remains to be seen where this energy will go. Will it institutionalize itself in opposition parties in the style of the coalition the JCP has called for? Will it remain a force in the street to counter the rank racism and proto-fascist tendencies of the Zaitokkai and similar forces of the populist right? Will it be able to sustain itself long-term and fight for systemic goals, or will it disperse into small pockets of political memory a la Occupy Wall Street? 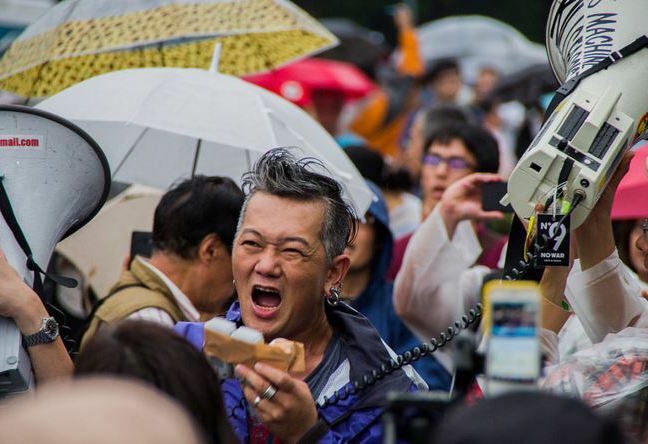 Will we see a new umbrella front of the anti-austerity left emerge in Japan, as in the case of Podemos in Spain, Die Linke in Germany, Québec solidaire in Quebec, and many others? The Japanese left remains deeply split and outflanked. So where will this energy localize itself? Will SEALDs or other organizations prefigure the emergence of new political apparatuses to sustain the social movements? Or will their institutional aspirations come to overwhelm their anti–status quo politics, as in the Syriza experience? More questions abound: could SEALDs undergo a more radical turn when it confronts the deep need in contemporary Japan to propose a mass anticapitalist alternative? Will such organizations be able to combine an anti-austerity politics with the equally crucial task of antiracist, antifascist struggle? All of these questions remain on the horizon and it’s unclear how they will be answered. Unquestionably, the struggle against Abe — against his regime’s open fascism, historical revisionism, vicious austerity, and authoritarian legislation — remains limited insofar as it is merely understood as a negative struggle within the parliamentary status quo. But we shouldn’t be too quick to condemn SEALDs and its associated organizations for their insufficient anticapitalism. Far more than old revolutionary platitudes about “reformist dangers,” the only true enemy that the Left around the world has today is nihilism, withdrawal, and abstention. To build instead a lasting space of contestation, at a distance from the state, but not disengaged from the electoral arena as a tool, is the challenge of our time. One thing is certain: revolt and resistance to the political and economic consensus is alive in contemporary Japan. In our current global moment, the stakes belong to all of us. Gavin Walker is assistant professor of history and East Asian studies at McGill University. His new book, The Sublime Perversion of Capital: Marxist Theory and the Politics of History in Modern Japan , is forthcoming from Duke University Press in early 2016. The growing youth movement against Prime Minister Shinzō Abe is disrupting Japan’s conservative status quo.